So, last week I started my new adventure (Hey! That’s where I got the idea for my blog name) by creating my ideal Sim in the world of the Sims 4. I was pretty stoked with the game and I finally managed to make a Sim that I found almost flawless using the new Create-A-Sim tool! Now, let’s see how my Sims version of Robin will actually fare in thus brave new world! Or town as it really is. Well, I do like this new cleaned up look of the town… or towns as they actually are. I sometimes had some problems finding the residential areas in The Sims 3 since the landscapes are usually huge. I do miss the condos that were added in The Sims 3: Late Night, though. 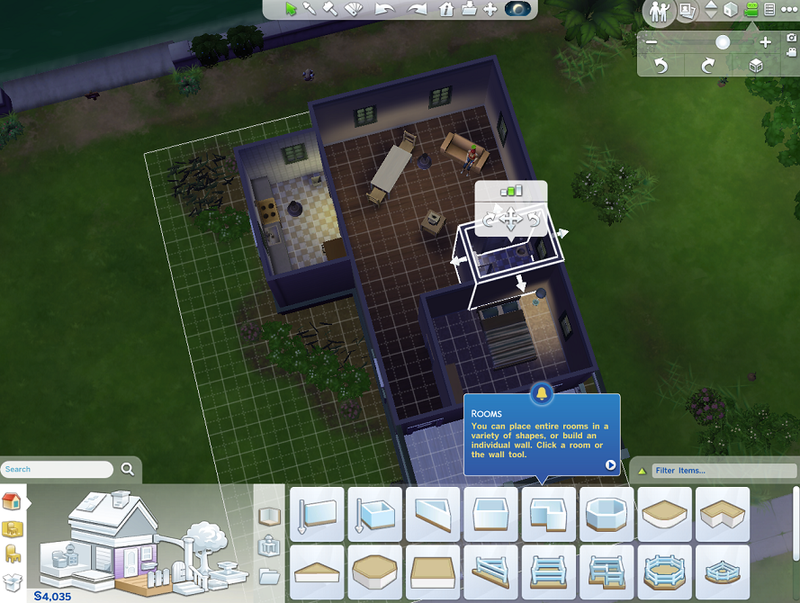 I did find moving in to be a slight headache since I don’t know how to preview the floorplan using the Sims 4. 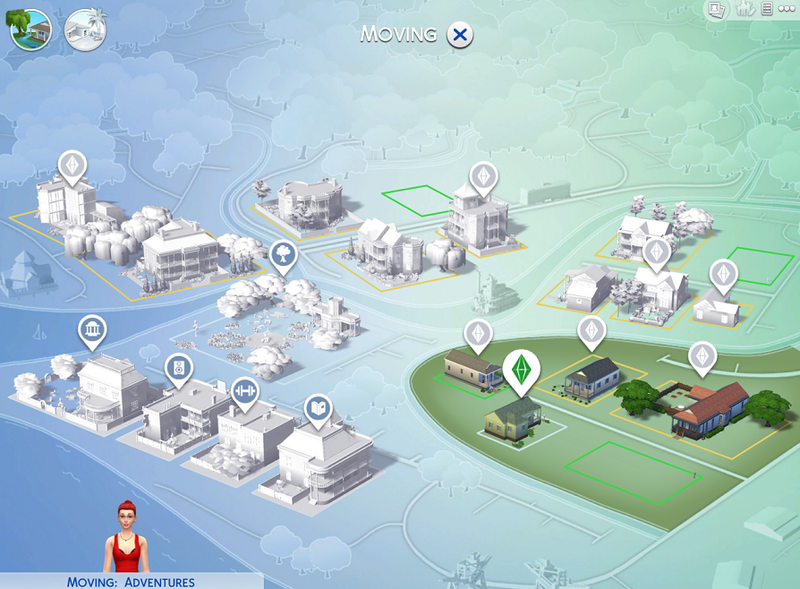 I hope Maxis updates the game and gives us the option to look into the houses before we buy them… or at least make it easy for me to figure out how to do it! Maybe I’m dumb but I just chose the first (cheap) house I found and purchased it fully furnished! I Want to make sure I learn everything about the game before I proceed with actually building my own house, you know! Hope it’s a nice neighborhood! Once again, I’m starting a Sims game from scratch… which is actually the fun part for me! I like making my character buy new stuff and modifying my new home. I love having my Sims start from a no-name lowly employee and then climb the job ladder to the top! I enjoy getting my little Robin to learn new skills like gardening, painting and the like. But, first things first, I gotta learn how to cook! I think cooking is actually the most important skill to learn! Cooking is pretty much something you have to do almost everyday. Even if you can store your leftovers in the fridge, I still enjoy making my Sim cook stuff and then even learn new recipes! Maybe it’s because I’m a frustrated chef! I watch all of these cooking shows in the Food Network, I’ve never really learned how to prepare any dishes I would call decent! 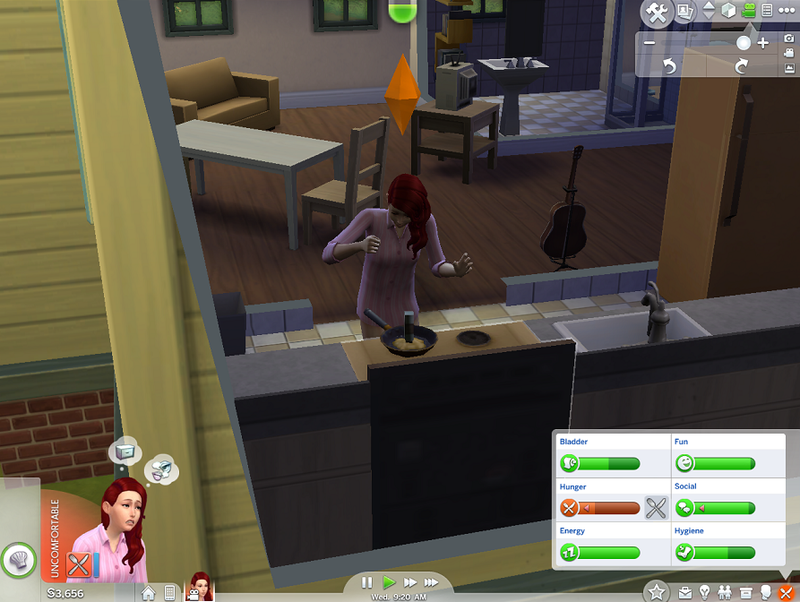 Anyway, it’s always been a good time to see my Sim start from being a total chump in the kitchen to eventually become a master chef! This time around, it’s even fun to watch her cook as a beginner! I think before, you just prepare a lousy meal… or cause a fire and die (which is horrific and hilarious at the same time). But now, if you’re a beginner, it’s actually very obvious since I’ve seen my Robin have to scrape the food off the non-stick pan, flip the dish right on the stove and, my personal fave, dropping the salt shaker right into the pan! Whoops! I’ve actually made this mistake before! The next thing I usually do is improve the bathroom. Yep, not the living room, kitchen nor the bedroom. The room I like to change first whenever I play The Sims is the bathroom! My issue with the bathrooms in the starter houses in every iteration of the Sims series is how small and compact they are! I may not be a claustrophobic but I just don’t like the idea of having such limited movement in a room where you can slip and hit your head on a ceramic item (like a sink, toilet or shower area) and die! Now, I know that hasn’t happened in any previous Sims games… but it’s something I don’t wanna happen in real life. I have to say I’m pretty impressed with the new build features of The Sims 4! Like the Create-A-Sim tool, I have to say that Maxis seemed to really put a ton of time into this tool because it’s so user-friendly! I may love designing houses in the previous games but I’m more of a seat-of-your-pants builder; I don’t have any solid floorplan in mind whenever I create a new home and this version takes that into account! Moving rooms around with a click of the mouse is brilliant and I can’t imagine why they haven’t done this before! Wish building a house could be done this quickly! Well, so far, all I’ve done is upgrade my skills and my house. Next week, I’ll be finally going into the world and explore! Hope to see you then! How’s your experience with The Sims 4? Let me know your thoughts on the game in the comments section below!